I'm a big fan of 'Don't Dance' by unsigned LA band The Monolators. I like it's perkiness and catchy guitar riffs. I first heard The Monolators on Kickstarter which is an awesome crowdfunding website for creative projects (read more about Kickstarter here). Having created all their past records out of their own pockets, this time The Monolators were asking fans for a little bit of financial help in reaching the finishing line with their latest album. Buy pre-ordering a copy of their already recorded album Silver Cities/Ruby Split EP they could raise the money to get it mastered and pressed to vinyl. Seems like a fair deal to me. 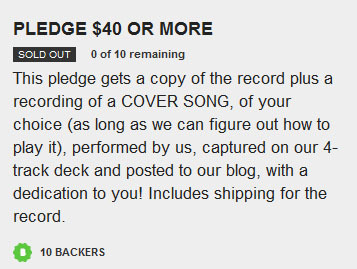 To help them reach their $1600 goal the band offered up extras to go along with copies of their new album including hand silk screened album covers and a hand-sewn pillow filled with their very own dog's hair amongst other things. Their DIY ethic paid off and they eventually hit their target although the dog hair pillow didn't sell. Can't think why! Awesome idea, cracking band! Well done The Monolators! To read the original Monolators Kickstarter project page click here and for more information about The Monolators click here.